Active Trans was thrilled to be able to offer financial support to bring Bike Week into additional communities throughout Chicago this year. Thanks to financial support from Google, Active Trans provided four grants to community groups so that they could host Bike Week encouragement and educational events. 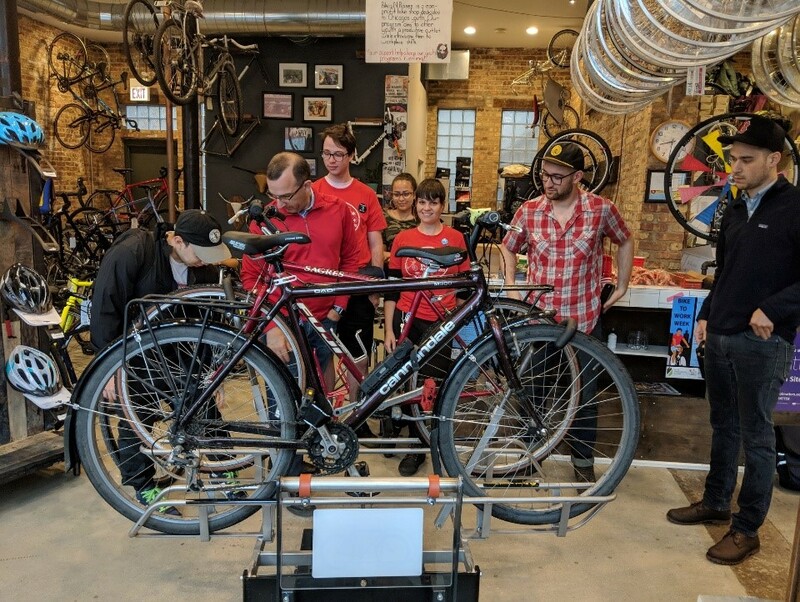 The North River Commission — serving the Albany Park, Irving Park, North Park and Mayfair communities — held several educational and encouragement events while partnering with local bike shops, Bikes N Roses and Tailwind Cycles. NRC was able to borrow a bus bike rack from the CTA so that folks could practice securing their own bikes to the front of a CTA bus rack without the added stress of holding up a crowded bus. The City of Chicago’s Bicycling Ambassadors were also at morning and evening pit stops offering guidance on helmet fit and safe routes to work or school. We Keep You Rollin’ Bike & Wellness Group, serving the Riverdale community area on the Far South Side, hosted a bike repair workshop on the first weekend of the Bike to Work Challenge to prepare local residents for the following weekend’s 3rd Annual Community Bike Ride. We Keep You Rollin’ once again showed how well it can unite community residents for health and wellness programming that is fun and unifying. The event also served as an opportunity to advocate for better infrastructure in the Lake Calumet region so even more people will be empowered to bike for transportation and recreation. The Logan Square Chamber of Commerce led a social media campaign to encourage people to share snapshots of bike commuting and running errands by bike at the local businesses in Logan Square. Boulevard Bikes, a local bike shop in Logan Square, hosted an event with Boulevard Brewing at Crown Liquors. With Milwaukee Avenue running through the community, it was a natural fit to promote bike commuting through the commercial corridor and heart of the neighborhood. We hope that community groups are inspired to participate in Chicago Bike Week in 2019 after hearing about the great events hosted by this year’s Community Bike Week grant partners. Want to improve conditions for people biking all around Chicago? Sign up for our advocacy supporters list to stay informed on ways to advocate for better infrastructure across the fifty wards of our city. You can also email julia@activetrans.org to join the Chicago Leadership Network to be the first to find out about other grant opportunities.